South Asian Americans Leading Together (SAALT) is a national, non-profit dedicated to fostering full and equal participation by South Asians in all aspects of American civic and political life through a social justice framework that includes advocacy, coalition-building, community education, and leadership development. Priya Murthy, Policy Director, appeared as a guest on WPFW Pacifica Radio in April to discuss immigration and civil rights issues affecting South Asians. Deepa Iyer, Executive Director, appeared as a guest on Beneath the Surface radio show on KPFK 90.7FM in Los Angeles, CA with Hamid Khan to discuss citizenship and immigration reform on April 23rd. Deepa Iyer spoke on the Applied Research Center’s “Race in Review: First 100 Days” conference call on April 28th. Lavanya Sithanandam, SAALT Board Member, appeared on “That Fresh Radio Piece” on May 18th on WMUC 88.1FM in College Park, MD to discuss the effects of recent immigration enforcement efforts and raids on the children she sees as a pediatrician in Takoma Park. Deepa Iyer will be speaking at Georgia State University at the Immigration & Human Rights Symposium on June 17th, 2009. Deepa Iyer will be speaking at the “Know Your Community: A Discussion of Issues and Trends Affecting Asian Pacific Americans in Washington DC and Beyond” sponsored by the Asian Pacific American Bar Association – Washington DC on June 3rd. SAALT welcomes Aaditi Dubale as the new SAALT Fellow! She will be working on Be the Change 2009, our National Day of Service, as well as supporting fundraising and development efforts. Aaditi can be reached at aaditi@saalt.org. SAALT bids a fond farewell to Aparna Kothary, Fundraising and Development Assistant. Aparna’s work at SAALT advanced the development of an individual member base, helped us to identify new fundraising opportunities, and expanded Be the Change – our National Day of Service. Join the SAALT Circle for a community service project with ‘The Sharing Place’, a food pantry at St. Pauls’ Lutheran Church in Jersey City. We’ll be preparing, packing, and serving breakfast and lunch to the local community. Come out and BE THE CHANGE! Please RSVP by May 26th at qudsia@saalt.org. Space is limited – sign up now! Check out events on SAALT’s Community Calendar. SAALT staff are available to speak at your student organization meetings, conferences, and community events on topics including immigrant rights, South Asians in America, civic engagement, and immigration. Please email us at saalt@saalt.org for more information. Get Ready for Be the Change 2009 – National Day of Service! What are you doing on Saturday, October 3rd? 1) Host a Be the Change event on your campus – If your campus traditionally hosts a Be the Change event or if you would like to start one on your campus, please fill out this form by May 30th and we will send you a planning guide and connect you to the national event. 2) Host a Be the Change event in your city– Join or start a planning team in your city. As a member of the planning team, you will be coordinating service events, recruiting volunteers, and connecting with other planning teams around the country. Please fill out this form by May 30th and we will connect you with others in your city who are interested in planning a Be the Change event. Our core cities this year are: Washington DC, New York City, South Bay, San Francisco, Atlanta, and Boston. We also welcome other cities to hold Be the Change events. 3) Join SAALT as a National Partner for Be the Change– If your organization, professional association, or youth group would like to partner with SAALT, locally or nationally, please email us at btc2009@saalt.org by May 30th. Did you miss the Summit? Support SAALT’s Work in 2009 Today! Are you a SAALT member yet? If not, we urge you to become a member today. By becoming a SAALT member, you not only receive benefits (such as our annual newsletter and discounts at events and gatherings), but the satisfaction of being part of a national non-profit organization that addresses civil and immigrant rights issues facing South Asians in America. 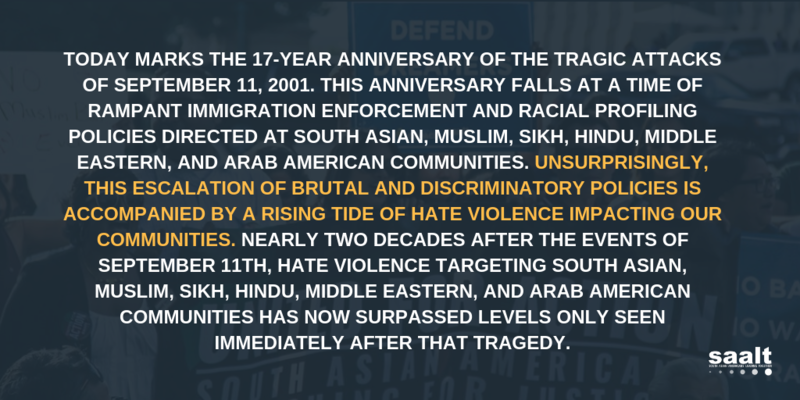 South Asian Americans Leading Together (SAALT) is a national, non-profit organization dedicated to fostering full and equal participation by South Asians in all aspects of American civic and political life through a social justice framework that includes advocacy, coalition-building, community education, and leadership development. Meet the 2018-2019 YLI cohort!